Sunscreen Blinds are also called daytime blinds or Light filtering blinds.Sunscreens are a great solution when you need privacy but still want to see the view. They also keep the harsh sun out without closing the room down while protecting carpet and furniture. 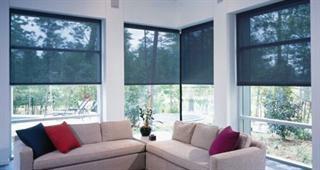 Sunscreen Blinds are often used in conjunction with blockout roller blinds to gain total night time privacy.